A 2-0 victory at Wingate and Finchley last Saturday has revived their faint hopes of reaching the Bostik premier play-offs. It’s a result they aim to build on at home to Brightingsea Regent on Saturday and in next Tuesday’s Sussex Senior Cup semi-final against Brighton under-23s at Lancing. Coach Robbie Blake has urged the players to keep working hard and taking a game at a time – and see where that takes them. It looks like they will be boosted by keeper Dan Lincoln being fit – despite ending up cut and bruised after receiving a boot in the face in the victory at Wingate. Another defender is set to return to the squad after injury, but others are out for longer. 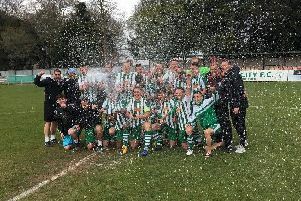 The Wingate win, courtesy of two goals in five second-half minutes by Mason Walsh, left Bognor ninth, six points off the top five, and it would take a fine run in the final five games for them to make the play-offs. Manager Jack Pearce felt the Rocks were ‘off-colour’ in the first half in north London but improved in the second, especially when Walsh was switched to a central role. Blake was delighted the team kept their league season alive at Wingate. He said: “Any time you get three points is good, whether you play well or poorly. We haven’t had a win in the past six games and it was important to get it. “I said at half-time we were trying to force too many errors. I said to Mason that defenders at this level switch off with a bit of interchange and give and go, and that’s what happened for our first goal. Once we got the first we settled down and scored a second. “We’ll take the three points and move on to the next game. We have to take one game at a time because we don’t know what’s going to happen. We’ve got to keep going for ourselves, for the pride of the football club and for the supporters." 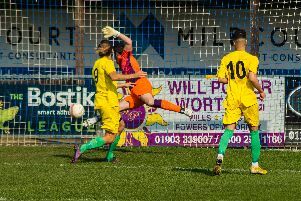 Keeper Lincoln is in with a fighting chance of facing Brightlingsea despite being booted in the face at Wingate. The reckless high challenge earned the home side’s Donovan Makoma a red card. After lengthy treatment on the pitch, Lincoln bravely carried on and helped the visitors to the win. But the custodian needed stitches to the wound caused by Makoma’s studs after the game. Pearce and Blake are desperate to have Lincoln back in goal for the run-in, with the Senior Cup semi-final clash with Brighton U23s on Tuesday looming. Left-back Joe Tomlinson should be fit for Saturday but right-back Calvin Davies is out for the season and striker Jimmy Muitt is out at least until the final couple of games. Pearce is delighted by the progress of centre-half Keaton Wood, who was out from September to March. "He's looking stronger every game," Pearce said.